This year, there are new ways to play FIFA. 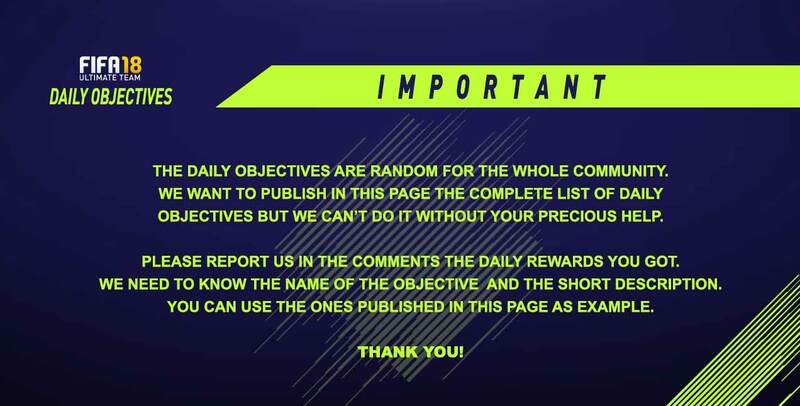 In this always updated page, you will be able to discover the FIFA 18 Daily Objectives List and its rewards. Complete dynamic daily Objectives in-game or in the new web & companion app to earn great rewards in FUT 18. From squad management goals to dynamic in-match challenges, the harder the challenge, the better the reward you’ll receive. FIFA 18 Daily Objectives are a new way to earn daily rewards in FUT 18. The Objectives vary in difficulty and are consistently updated. Each day, at 10am (UK time), at least five new objectives are released. If you don’t claim your rewards before the Objectives reset, EA’ll automatically add them to your Club and you will be informed by a pop up. 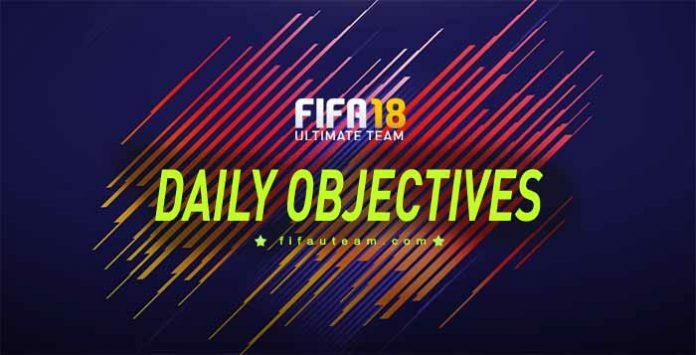 Let’s find out the complete list of daily objectives. When you complete a daily objective, you earn a reward. There are no extra rewards for who completes all the objectives from the same day. Unfortunately, there are no fixed rewards for each task. In other words, before you complete the objective, there is no way to know what you will win. Let us know in the comments if you got anything different. Can anyone explain please how to complete the CROSS IT ( assist a goal using any cross with an english player)daily challenge? I performed a cross with an english player and scored the goal but the challenge didn’t complete and I’m confused. Received an ultimate pack for playing 10 games over fut today… unreal. Nothing really in it top players aduriz martial ederson. Rest were discard value but all tradeable! Very happy chappy ! I got a Gold Gift pack+coins for scoring one from corner. Congratulations. It was much better than most of the rewards. I got a freking Rare megapack!! Really? Are you sure it was assigned to you by completing a daily objective? Is it possible that there are no rewards for completing the daily objectives, because i didn’t get one. There are rewards for all daily objectives. No. There is no special rewards for completing multiple objectives. You will have to contact the EA Support. i got one called fancy, hold LT when you shoot to add flair to the shot but i dont know what players to do it with. Have you tried to buy it using ‘buy it now’? is there an extra reward for completing all 5 daily/weekly objectives? I did: Two for Netherlands and got 100k (Rare Jumbo Players) pack for it. We watched videos where people got 25k and 100k packs but we still think it is not possible. Maybe they are fake or maybe they are opening any other reward they had in the store. Can confirm that you can get 100k pack from daily objectives. Was quite surprised today. Got inform Vidosic, Glik, 2 83-rated players and the rest was garbage. However, you can still add jumbo rare players pack as a possible reward. Rodrigo, couldn’t be. Haven’t done any sbcs that morning or the day before. Furthermore, jumbo rare players packs are available only if you trade icon or do 89+/90+ rated sbcs. I haven’t done any of them. I stopped buying packs a while ago and as far as I know last jumbo rare players pack were possible to buy during TOTY. I don’t play drafts and I am silver 3 fut champ player and elite 1 squad battles player so you know that you cannot get jumbo rare players pack as a reward. On top of that I did my last weekly objective on Saturday. So it was daily objective reward but I’m sure I won’t get it any time soon 🙂 It’s EA they have no logic! Thank you very much for your reply! We already added the 100k packs to the rewards list. I had to buy a defender using buy now and the reward was a bronze 4 contracts pack.